Rate this Article With all the attention focused on PC-powered and mobile-powered VR headsets, Intel has something much more unique to offer - an all-in-one, mixed-reality headset, called Project Alloy. The continual growth of the virtual and augmented reality industry has spawned so many products for both hardware and software. The observable efforts to dislodge the old computer monitor as a primary display device can be seen with the emergence of so many different HMD’s (headsets and holo lenses). Intel, the foremost manufacturer of computer chips and processors has finally joined the fray. Recently announcing their mixed Virtual and Augmented reality system called Project Alloy, the company has unveiled a prototype all-in-one headset that does not need any tethering of any kind (not at least operationally) nor any external tracking equipment similar to the HTC VIVE or the VRcade overhead mounted camera system. An alloy is defined as a combination or fusion of one or more metallic and/or non-metallic elements and a base metal element. In a similar way, Project Alloy seeks to combine the best features of VR with AR and Holographic technology into one cohesive system. However, what Intel is really pushing for is not the actual headset itself but its RealSense tracking technology system, a small circuit module that integrates a duo 3D camera sensor that can track your surroundings in real-time, eliminating the need for external tracking devices limited to a specific area or room configuration. The system can measure relative depth, position and orientation. This will allow a RealSense equipped headset integrated with all the computing components and software applications to place the user into a virtual world that interacts with the current real surroundings creating a form of Merged reality. You may be in a virtual world but the RealSense motion tracking will see the objects around you and display them inside virtual reality as you move closer to them. This will prevent unwanted events or accidents like running into a person near you or a wall, a table, a chair or whatever is around you. RealSense can even track the location you are in and show if you have moved into another room or area. Aside from this, Project Alloy eliminates the need for external controllers like game pads and the like. You simply use your own hands to interact with both virtual and real objects. The demo showed using a real object like a paper bill to interact with a virtual object. 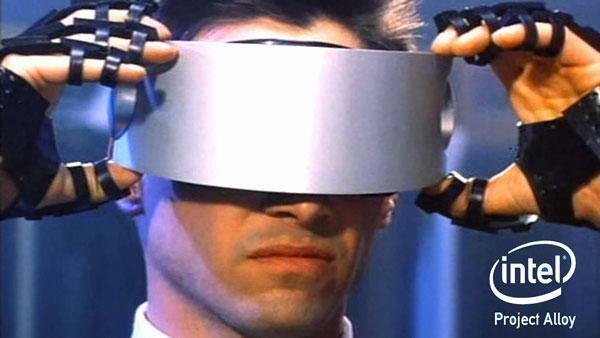 One could actually see one’s own hands and the real world object within the running simulation in Virtual Reality. The headset itself is completely self-contained with its specialized integrated computer (the RealSense system) and its own power unit or battery pack. All that has to be done is to load a program from a Windows 10 compatible PC and the Merged Reality is ready to go. Project Alloy is still currently under development and the system is not as precise as the current high-end headsets we have today. Intel’s objective is to open source the technology by 2017 so that VR and AR equipment manufacturers can make use of it and incorporate RealSense into their own HMD’s. Intel’s main competitor AMD has also announced its own Sulon Q project which functions along similar lines and targeted towards the same market and AMD is probably planning (no doubt) the same thing. Microsoft itself has already been positioning its Windows 10 Operating System to integrate with both AR and VR worlds. Together with Intel, both companies are working to bring out the next generation of Merged Reality compatible PC’s and HMD’s. Microsoft itself has its own Holo-Lens technology which is actually Augmented Reality where 3D virtual images are blended in with the real world. Microsoft calls this a Mixed Reality. The Holo-Lens functions opposite to Project Alloy’s Merged VR headset where it brings VR into the real world as Alloy bring the real world into VR. Regardless of which method the user prefers, applications will need an OS to run from and Windows 10 will naturally be pushed as the standard for the up and coming Intel based PC’s and HMDs with full VR and AR Merged capabilities. Microsoft will soon be releasing an update to Windows 10 which will enable current PC’s to run the Windows Holographic Shell with Mixed Reality and universal applications. Windows Holographic provides an entirely new experience for interactive multi-tasking in an augmented reality environment. Instead of using your daily point-and-click while staring at the monitor routine, the shell will blend both 2D and 3D apps at the same time. With holo-graphics, interactive 3D objects can be manipulated and accessed while using the Holo-Lens. With Project Alloy, Windows 10 will be brought into Virtual Reality with the user being able to both access the apps and the real world at the same time. Both Intel and Microsoft share the goal of enabling their hardware partners to build a wide range of mixed reality devices that will cater to both the current consumer and business market and will jointly release a specification for head mounted devices at the Windows Hardware Engineering Conference in December in Shenzhen, China. 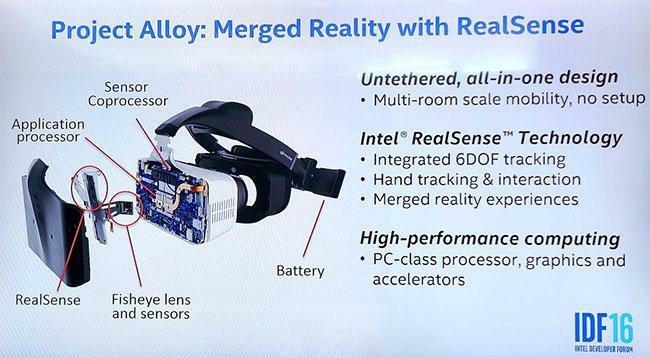 With Project Alloy technology to be open-sourced to the Merged VR/Mixed AR industry, both Intel and Microsoft seem to be setting the standard again for the future computing industry.